Remove 1 bad publicity per agenda point that the forfeited agenda was worth. Gain 1credit for each bad publicity removed. 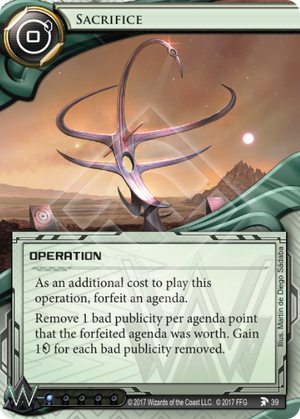 If the Corp forfeits a Project Beale with an agenda counter on it when they play Sacrifice, how much bad publicity can they remove? The Corp removes three bad publicity as the Project Beale was worth three agenda points. If the Corp has less than three bad publicity, they remove all the bad publicity they have and gain that many credits. Can the Corp play Sacrifice if they have no bad publicity? No. The effect of Sacrifice does not have the potential to change the game state, so it cannot be initiated. Once upon a time, we thought Weyland was an ordinary little corrupt corporation. Killing and Making Money were all it was about. Typical Corp behavior, right? But then we saw another layer. We saw a Weyland that was interested in Making the World Better, in helping children reach their potential, in finding new realms for humanity to live. And, if I remember correctly, this was a "rebellious element" within the corporation, a noble-minded executive who actually wanted to do some good, by taking the human race into space where we might have more room to live. But really...was there something even more complicated, more sinister, behind BOTH groups? What might motivate ALL of this: the killing, the money-making, the philanthropy, the vision? A Cult. Hidden at the highest levels. In Space. It's possible. We have creepy stained-glass window funeral parlor/temple guy we have slightly-more-than-just-pop-culture-image. We have Ancient Space Deity (An evil Oyarsa of Malacandra?) and now, we have this card: Incredibly creepy sacrificial altar/execution chair exposed to the Martian elements. Weyland, why did you REALLY want to go to Mars? A card for Jemison Astronautics: Sacrifice. Audacity. Success.. It's great at removing the bad publicity from the 2/1 card Jemison decks love to start off a trade chain with: Hostile Takeover. Checkpoint (Order and Chaos) is a 4 + bad pub 7 strength code gate with a trace 5 that deals 3 meat damage. If you have the ability to remove the bad pub it's pretty taxing. Reality Threedee (Data and Destiny) is an NBN card that gives you 1 per turn, 2 if the runner is tagged in exchange for 1 bad pub at rez. Hellion Beta Test (Flashpoint cycle, Escalation) is a HB operation that gives you bad pub if the trace fails. Bulwark (Flashpoint cycle, Intervention) is a 10 + bad pub ice with a "trash a program" and 2 times "corp gains 2, end the run" and a bonus of getting 2 if encountered while the runner has an AI installed. Even without the bad pub it's expensive to rez though. Of these only Checkpoint strikes me as a good fit for Jemison decks, with 4 it's easy enough to rez and it's pretty taxing, even if the runner fires the trace a trace 5 will generally require a few credits and as Weyland you may well be rich enough to raise that to a trace 8 or so to make the runner pay a good amount for passing. This all doesn't mean Sacrifice is worthless. Not at all. The ability to remove the downside of Hostile Takeover is as useful in Jemison decks as the ability to shuffle cards from archives into R&D is in, well, any deck. It's an operation so it's easy to play Consulting Visit. One thing to note is that I think it's not allowed to play Sacrifice if you cannot remove bad publicity since the effect doesn't change the game state. Not 100% sure though. Why would you want to play Sacrifice without bad pub to remove? Well if the runner has trashed your Quarantine System or you simply don't have it installed yet it's a good way to trigger Jemison's ability. Overall this is a good card for Jemison. I doubt it'll see much use outside it though. The first issue means that you usually cannot play this unless you're playing against Valencia or you scored a Hostile Takeover. Until then it is usually a dead card. (ignoring Illicit ice or a stolen agenda) The second issue is even more severe: What makes Quarantine System and Oberth Protocol really nice is the fact that you can bank the click to play the card on another turn. This way you can fast advance 2/4 agenda or even a 5/3 using Oberth when sacrificing a one point agenda. Using Sacrifice means that you can only Install-Sacrifice-Advance for 3 Advancement tokens. This is a rather small return of investment and you gain only one credit by using it. Even worse you cannot transform a 2 pointer into a three pointer with this card and this is in my opinion the fatal blow for this card in a Fast-Advance style. Supposing this card is meant for another archetype I struggle to see how that one would look in Jemison Astronautics. Removing bad pub is either useful to disable Blackmail or to make running against a glacier deck costlier. This might mean an HB deck running Domestic Sleepers can use this to disable Valencia or run illicit ice like Fenris, but realistically I don't see those strategies take off. All in all I can think of using this as a one of to ensure that you have one ability to sacrifice agendas which cannot be trashed and can be your 'silver bullet' against Valencia matchups.